The only thing I knew about We Are Kings... going into the performance was that it was a collaboration between the choreographer Matija Ferlin and (some of) the acting company of the Croatian National Theatre in Zagreb. Within five minutes of the play starting it became clear that this was, to many intents and purposes, “Croatian Monkey Bars”. Which felt like a complete result. In case you don’t know, Monkey Bars was a show made in 2012 by British theatremaker, poet and theorist Chris Goode. It was, in British terms, ostensibly a piece of “verbatim theatre” in which interviews with 72 children were performed by six adults, often in short scenes resembling various situations from adult life – memorably, several children discussing favourite sweets and hypothetical superpowers became a job interview (“What you'd do if you were made out of [your favourite sweet]?”). What’s fascinating (for me, as a British critic) are the differences in approach here. In many ways, it’s almost like the information prioritised has been turned on its head – with Monkey Bars the emphasis was very much on the source of the text and then the name of the editor, who also happened to be the director. Here it was the name of the choreographer, then the ensemble, and then looking afterwards at the programme, the fact that We Are Kings... is “a formal exploration of stage movement and language”. The movement – the “director” is a choreographer after all – varies enormously. Mostly we’re talking about short bursts of solo-work, expressive, various, oblique shapes stolen, distressed, from classical ballet, or, elsewhere, maybe precise copies of children’s dances copied from video recordings – something of the same strange intentness and half-learnt shapes of adulthood combined with the anarchic impulses of the child’s own body. For much of the time, though, the “movement” is walking or standing. Textually, it’s both funny and serious. Opening with the bizarre versions of received wisdom on how life on earth began – everything from surreal versions of Intelligent Design and creationism through to even less plausible versions of evolution – mankind’s discovery of fire progresses from finding burning trees struck by lightning with finding matches and a lighter with remarkable speed. Similarly, human reproduction is a mangled and benign process of babies growing in tummies with or without causal process. Overall it’s a strange watch (more so for me than most, I guess). I think I was probably watching far too much through the filter of Goode’s show to truly take this only on its own terms. And I was also literally reading what the people were saying (excellent translation surtitles, btw) rather than listening to it and watching just the movement – which is, let’s be frank, a completely different way of receiving information. So, I think I understood the value of listening to how and what children say more because of the “message” of Goode’s original dramaturgy than about anything here. Interestingly, though, ...Not People thematically starts with birth (of the universe as well as people) and end with a reflection on old age, so maybe the “narrative” here is simply more traditional, more A-Z. The ending, consequently, was probably the most moving part, Children’s offhand compassion for their elderly relatives does stop you in your tracks. And, of course, this being ex-Yugoslavia, the lives of the parents and grandparents are more coloured by striking images of war than most UK under-10’s will have been. But, really, overall, I just really loved it. 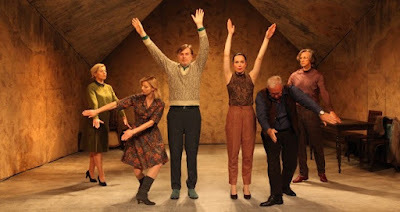 It was funny, engaging, and at the same time, clearly intelligent and making what felt like a genuinely bold experiment with form(s), somehow managing to suggest a modern staging of an Ibsen classic with the minds of adults replaced by those of children. Some of the performances were properly outstanding, and there was even a (live?) early-Cure sounding punky eighties (live?) band playing the odd musical interlude song. I think if I’d had my serious analysis hat on, there’d be much more I could have excavated from it, but as it was, it was also wholly enjoyably on a level of simple childish pleasure, which also feels important to have as a thing once in a while.